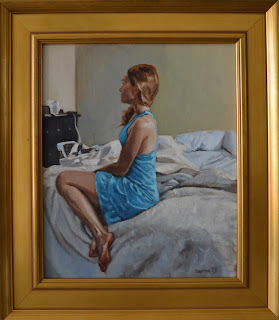 'In Blue on Bed' was an incredibly fun painting to paint. You may even see some of my joy oozing out of the brushstrokes. I used a different type of board made from birch. It was definitely different. I felt like the nylon brushes I used got quite a beating off the rough texture. Maybe for the next one I will take some fine sandpaper to it to smooth it out. Even though I was experimenting with a new surface, I am happy with the end result. The smaller scale made me practice the constant saying I tell my students of 'measure twice, stroke once', where by I look at the subject deeply, get the right color and tone, then in one swoop I cut in one significant brushstroke that defines and gives life and shape to an area, such as the highlights especially in the foot and shoulder.